I can’t remember the last time K asked me to bake something for him. Usually he hates the way the house smells when I am baking!! weird i know… but then… that’s him… quirks and all… So when a few days ago he asked me to bake “that kind of cake you get in these small bakeries, with the coloured tutti fruiti” I was determined to make it the best damn cake he’s eaten in that category! After all I had a point to prove… “ask and you shall receive … don’t just turn your nose up at my baking….” Is this making sense? I thought not…. 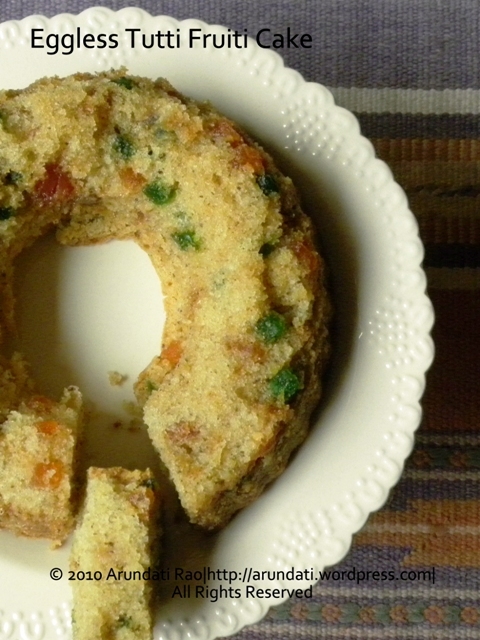 Anyways then, over to the cake, I browsed a few recipes and then decided, pound cake it was going to be. I usually bake with vegetable oil, but since K asked, I was going to use “real butter”. I recall a pound cake calling for equal quantities of everything… so i just went ahead and made it up. The batter was simple enough to make, but horror struck me when 10 minutes after popping the cake into the oven, the power went off!! i sent out an SOS to three baking pros. They all responded with a “let it stay in the oven, the texture may suffer and may sink a bit, but other than that no major damage”. So much for wanting to do all of this for K!! anyways, an hour later the power was back on and i extended the baking time by 5 minutes. The cake turned out fabulous. The texture was crumbly and yet rich with all that butter, I tasted and realised I’d really forgotten what baking with real butter tastes like!! I would definitely reduce the amount of butter tho, because it was too much for me! K came back late that evening and forewent his dinner for a big piece of cake, and the next morning he wanted it for breakfast. I will surely be making this again considering the response it got! Try this one out…. its a winner!! In a mixer or manually with a whisk and a bowl, Cream the butter and the sugar till smooth and fluffy, add the flaxseed mixture, vanilla extract and mix thoroughly. Add the flour in about 2-3 portions alternate with the milk, mixing well to incorporate it. Add the tutti fruiti and mix with a spoon or spatula. Grease a 6 inch baking dish (i used a bundt / tube pan). Pour the batter into the baking dish and bake for 26-30 minutes in a preheated oven at 185 degrees celcius. Check at 20 minutes with a cake tester and increase baking time by 4-5 minutes if required. Mine was done in 25 minutes. Cool in the pan completely on a wire rack (i forced mine out and hence it didnt come out clean). Slice and serve. i suppose this can be stored in the refrigerator, mine did not last for even 24 hours!! Previous Post Any foodbloggers game to meet in Ahmedabad? Next Post Can you tell I love happy colours? Hello Arundhati, Could you please help me out with the measurement of butter in this recepie. 2/3 cup butter would be how in grams. i get unsalted butter in minimum 100 gms packaging in the Nilgiris store. Your response would be very helpful. I have messed up chocolate cake 2 times in my baking attempts for the first ever time. Yeah, that cup is a part of of a set….and indeed there is a 1/3 cup measure which I don’t remember using……Thanks a lot Arundati…for taking trouble to explain….I’ll try this recipe this weekend. I may sound very silly…but should we grind the flax seeds along with the water or should we powder them and mix it with warm water…I have a packet of them at home ( bought at FabIndia) and have been waiting to use them…this seems so perfect…. nothing’s silly babe… i dry grind a few tablespoons and store in the fridge, just mix the required amount in water and use…. its difficult to wet grind smallish quantities…. YUM! 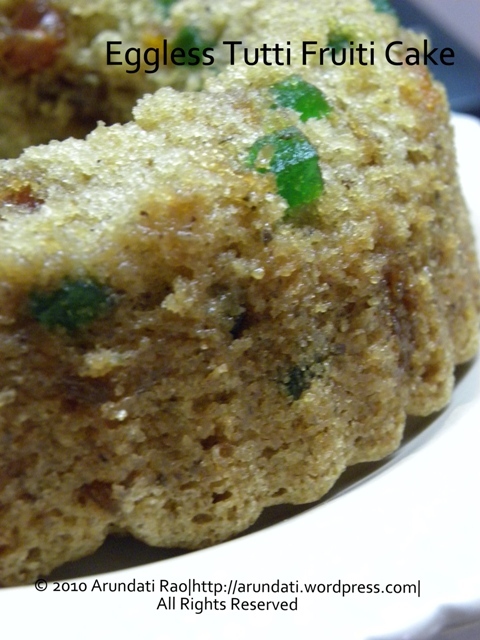 I used to eat Tutti Fruitty cake in Bangalore, looks so good A, good job. that looks great aru..good that K liked it!.. I love tutti ffruiti cakes to which we get back home and this looks so soft and delcious. My hubby is opposite to your, he love the smell of baking especially when i make breads. can we substitute flaxseed with something else Aru? I am not sure if I will be able to find this in Gurgaon. Nice nice… BTW, according to one of my candidates, K “foregoed” his dinner that day… God alone knows how I stopped myself from laughing in that interview when she said she “foregoed” her salary at some company! haha… sweet angel…just add 2-3 tbsp of cocoa powder and leave out the tutti fruiti… but then what would be the point…there are also a few chocolate cakes here on the blog….